Nard can choose multiple effects for his bardiness involving healing, forward, etc. So while we wait for Adder to lift some weights (I predict he'll take Merciless since that's a good Fighter perk), I'm going to continue the story. Bohan proceeds to sit down on a bench near the cooking pot. "This place reeks of an evil beyond simple undead. There is mighty magics at work here, and it's a vicious cycle of undead birthing undead." He shakes his head in disgust. "I've no doubt you've already faced a few undead popping up from the ground we tread upon. These are servants of this fort long passed. I dare not speak if they were virtuous in life, knowing full well of the bloody history before this country was reclaimed by the race of minotaur, but I speak with certainty that in undeath they have no sense of morality. Most are simply without soul, some bound to life by a terrible force, maybe a couple willingly." Raina strokes her hair back in contemplation. "So, uhhhh, yeah. Funny story. I was brought here by, uh, a certain offer. Nothing major, nothing big..." she starts batting at her hair in order to delay the truth. "Just... some old dude came up to me, offered a job of clearing out a fort of a few undead, promised riches and left it vague if I could loot the place of whatever mysterious objects lie within." Bohan lets out a rather heavy sigh. "And pray tell where is the party you brought along with now?" Raina is taken back quite a bit. "Okay, rub it in! They didn't really make the cut of storming some horrific mansion of the undead!" Raina just kinda shrugs. "I was promised good pay for this. It was ambiguous. Seems you lot were suckered in for the same deal. A sure decision from the heavens that with our paths ever intertwined, we shall join forces and eradicate the evil of this land!" Bohan proceeds to stand himself up. "Whatever the case... I'm afraid my energy is starting to fail me. Now forgive me for eavesdropping, but did I not hear more of you coming into this damned fortification when the storm picked up? If I may, I wish to excuse myself to whoever you may have left behind, I fear I have forfeit all my offensive power and can only go completely on the defensive." For everyone here, if you have any questions, concerns, insults, now is the time before Bohan backtracks to join Lorrin and her dwarven sons. Meanwhile, for the next area, Raina will accompany you. Using an herbs and poultice set she's back in tip-top condition. Perhaps you'll see what power she seems to exert judging by her stressed appearance earlier. The party is given a strange choice... Two hallways are in front, double the hallways expected from before! One seems to lead right into the main hall, the other kinda winds, and even has stairs. This seems to be a bit of an alternative route but you're not sure what dangers may lie ahead. Winding creepy hallway leading to some stairs? Adder was curious. "I wonder where those stairs go. I'd rather we go that way." Ruby looks down the pathway towards the stairs, deciding to use Trap Expert before the party made a decision. "Hey Raina, were there any interesting things in that room you came from... aside from anything dead dead"? [USER=35827]@The Man in a Red Suit[/USER] Ruby, you know for a fact there aren't really any traps. However, you are able to tell that the main hallway leads to what you can assume is the grand hall, and you have this hunch that you might be ambushed there. However, that path is still a viable option and possibly the fastest to the grand mind behind this trap. The other winding area, you feel might be... slightly hazardous? But you discern that the undead tend to NOT go this way, and this detour may help you avoid unneeded combat. After all, it's common knowledge that you strike the head of some evil force raising up minions, the rest just fall like dominoes. At least with vampires anyway. Raina does indicate that while she just came from the grand hall, the place was surprisingly empty. However it seems that in the time of combat, there is the chance that forces are assembling nearby. She didn't really see anything major, mostly old dusty decorations and furniture. She does mention she was in a separate room when her party entered, but uhhh that room is kinda full with dead party members. Yes it sounds suspicious, she knows, even with a Paladin it still seems awfully strange her own band got wiped out, she asks to confirm your suspicions AFTER the fight. So there lies the conundrum. Do you wish to take on the army that lies nearby, or shall your party sneak by, attempting to find the heart of this evil business? After spending a short time considering their options, the thief spoke. "I agree with Adder. I think going for the stairwell is our best option right now." Adder turned to him. "You know what? When I bought this sword, The Harbinger, the dealer said something about spirits residing in them that I could consult. I tried calling them the other night at the inn to help me find a nice wife, but it only led me to a weak floor plank that got me stuck dangling between my room and the room downstairs. HOWEVER, I feel like I could do it right now, becuase I was quite drunk at the time anyway." 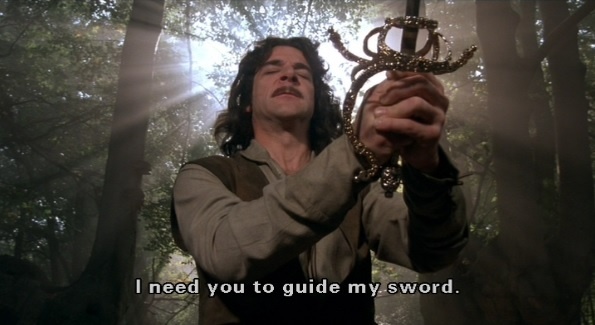 Adder twirled the sword in his hands. The dealer never said anything about reciting any words but he liked to make things up as he went along. He glanced over at Memylir thinking of something cool to say. He cleard his throat and closed his eyes. "Oh heavenly spirits that reside in thy blade. I call upon thee to guide us to our glory. Which way shall we take? Lead me, oh heavenly spirits. I am devoted to your powers." Adder tried chanting nonsense just for effect. And so Adder used Heirloom and rolled a 2d6 + CHA even though he knew he didn't have any CHA modifier and, in retrospect, should have checked the skills he could learn before joining the quest. "Um... yeah. I'd like to AVOID a fight with an army", Galois voicing his concern. "Lets take the stairwell; single file like last time, but with Ruby up front and Adder behind us". It didn't matter which way the group went, the priest thought. The group was fortunate that Ishume was benevolent enough to allow them to be where they are. Yet, the priest knew she could only go so far and had decided the stairwell would be the better option for now. She was thankful that Bohan had given her the ankh which also contained Ishume's blessing. A new power flowed through her and she knew it would be useful in this stronghold of the undead. "I too, shall agree with taking the stairwell," the priest declared. "We had just gone through battle with a troll and to exhaust ourselves further would be detrimental to the task at hand. We wouldn't want to be exhausted by the time we figure out who the mastermind here is." "I see you've all come to the same conclusion that I ingeniously came to a long time ago but didn't bring up, that we should take the stairwell instead." Nard nodded his head, arms crossed in satisfaction. "It would likely be much safer. Let's just all remember that I thought of it first." Secretly Nard was hoping to go through the main hall and prove that he is in fact good at combat. The party made quite the brief discussion and it was unanimous that this alternative path would be best since there were no traps in the hallway preceding the complex maze. Still, when it comes to the choice between hungry undead and dangerous not-sentient traps, the winner is obvious. -rips up the monster encounter data she worked oh so hard on for two minutes- All for the better, I suppose. Your party has chosen the MONTAGE PATH!!! Time to test your roleplay and perhaps some dice rolling, you will all be helping to build the way to the boss of this here haunted fort. Since our Bard insists he was the original idea of going this way... [USER=30663]@Valigarmander[/USER] Nard! I want you to describe a hazardous room. It could be a certain long hallway, it could be a corridor, it could even be a dead end! After Nard describes the situation, I want [USER=31048]@ScottyMcGee[/USER] Adder to describe how he helped solve this room. This will include a dice roll, so figure out what kind of move you're going to do and figure in the appropriate stat modifier. The party crept down the winding corridor and up the stairs. The narrow passage was hardly wide enough for the group even single-file, and the noise of everyone's booted feet clanking and clomping on the worn stonework steps echoed up and down the stairwell until it became what felt like a roaring cacophony. The noise finally died down as the party reached the end of the stairs, emptying out into yet another tight corridor. Ruby suddenly stopped in her tracks, staring ahead at the passage before then. The others all tried looking over the shoulders of whoever was in front of them to see what had made Ruby stop. The corridor extended forward perhaps 100 yards, and was less than an armspan in width. The way is sparsely lit by flickering candelabras (though who put them there and how they're being maintained is a mystery). At the far end of the corridor, a pair of keen eyes can make out a door. Between here and there however, the floor is entirely collapsed. An inky darkness fills the pit below; it's too dark to tell exactly how deep it is, yet one can discern the twinkling of a number of sharp points. The walls on the left and right extend from the current level down into the darkness. A brick or crumbled piece of stonework jutting from the walls here or there where the floor once connected may provide a small foothold (of uncertain stability), but apart from that there's no readily apparent means of getting to the other end of the corridor. Apart from that, there are a number of other doors lining the corridor, including one immediately to the right of the heroes, yet apart from the door at the very end of the hall they appear to all be bolted and/or boarded shut. "What an awfully tight space," Adder murmured at the corridor. He contemplated over the perilous depths. Jumping over would be risky, as well as trying to sidle around the edges. He turned to the boarded door next to them. Calling out the spirits from his sword was a total failure. He hadn't even glanced at Memylir since then out of sheer embarrasment. But at the very least he could impress her with his usual physical strength. Adder uses Bend Bars, Lift Gates to break down the door by kicking it. It didn't take long for the hinges to break free and the door to open, neither did the effort make an inordinate amount of noise. Calling upon pure brute strength, Adder successfully strikes a mighty blow to the door. Quite enough power that it doesn't fall over but kinda just crumbles. Shame it was a beautifully crafted antique of a door, not even the most skilled blacksmiths in Valhalla could put it back together. So next up, [USER=31048]@ScottyMcGee[/USER] Adder, why don't you describe the next obstacle you face, and then let's have [USER=35827]@The Man in a Red Suit[/USER] Ruby take a shot at it with a roll. [USER=26554]@Microphone_Kirby[/USER] Yo Galois why don't you give us a room to go through and have [USER=19313]@StarryPeach[/USER] Memylir get through it. This is alongside Adder giving a room for Ruby. Also I just listened to a podcast of a game called Danger Patrol and it sounds amazing because every situation can potentially cause quite the disaster! I might run that alongside this game. Dunno how much Danger Patrol is. Adder stepped forth first. The floor was littered with bones - it was hard to tell if they were human because they were all just scattered around. Three steel doors faced them on the far wall, except they had no hinges and no knobs or handles. Adder wasn't quite sure if they were even supposed to be doors. They were wide and tall enough for an average human to fit through. The sight of all the bones made him wary of stepping any further. Adder scratched his head. "Not sure what all of this means." He turned to Ruby ([USER=35827]@The Man in a Red Suit[/USER]). "Thoughts?" Wary of the bone-filled room, Ruby decides to use Trap Expert once more.